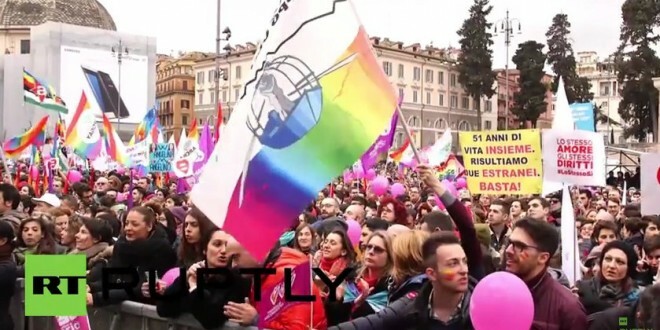 ITALY: Thousands Of LGBT Activists Protest In Rome Against Watered Down Civil Unions Bill [VIDEO] - Joe.My.God. Thousands of gay rights activists and LGBT families rallied in Rome to protest against the watering down of Italy’s civil unions bill, which no longer envisages adoption rights for homosexual couples. Protesters carried banners that read “We want equality” and sported the gay pride rainbow on their faces, with one man naked apart from a cardboard fig leaf with the words “civil unions” on it. “Today in Italy, in 2016, we still have to beg for charity, for crumbs, in terms of rights. We want equal weddings, adoptions and full rights. Full rights,” Alessia Avellino, a 21-year old sociology student, told AFP.